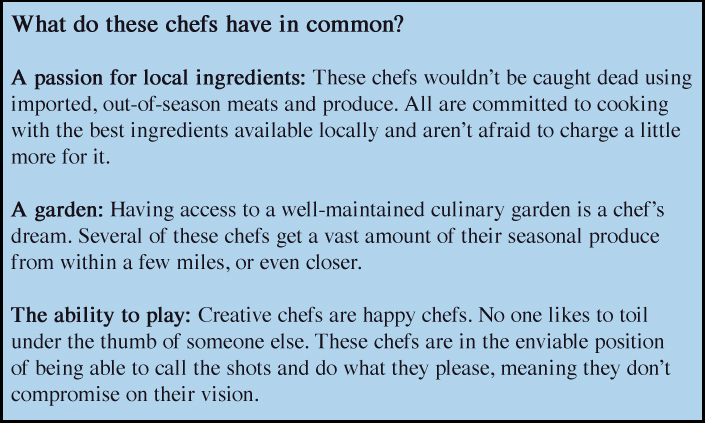 The best chefs are often the ones you don’t hear much about. They’re the ones who spend more time practicing how to make the perfect 63-degree egg than fluffing their own feathers. Not that they don’t get accolades such as Michelin stars, sold-out dinners and kudos from foodies who adore them, because they do. They just don’t brag about it. 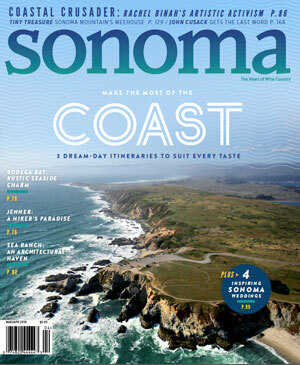 So it’s time to shine the spotlight on six of Sonoma’s most show-stopping toques who toil away behind the scenes rather than out in front. Chef Jesse Mallgren at Madrona Manor Restaurant in Healdsburg. It’s an odd matchup: a chef on the cutting edge of modern cuisine operating inside a quaint, Victorian country inn. “Stylish, high-end cuisine in a cozy, Old World setting,” is how he describes it. 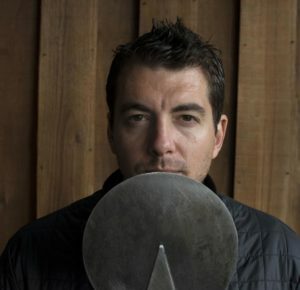 Since 1999, 44-year-old Jesse Mallgren has been quietly elevating Sonoma cuisine, one can of liquid nitrogen at a time. But don’t expect a showman in the kitchen. 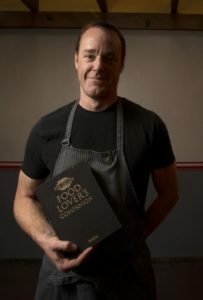 Mallgren is quiet and disciplined, having served in the kitchens of esteemed chefs Jeremiah Tower and Gary Danko, and lets his Twitter account (@madronachef) do most of his talking. With an inspiring kitchen garden, relationships with some of the region’s best meat and cheese purveyors, and free rein to run Madrona Manor’s culinary program exactly as he wants, Mallgren has a dream job he takes very seriously. For years, he’s been chasing a second Michelin star, which seems nearly in his reach. Ultra-seasonal tasting menus include tiny, tweezer-placed bits of protein, garden vegetables and herbs, and French-inspired sauces (scallop crudo with lovage and edible flowers; pork jowl confit with apples, lentils and chicory), and liquid-nitrogen ice cream made at the table. Executive Chef Shane McAnelly at Chalkboard Restaurant in Healdsburg. Many in Healdsburg cringed a bit when William Foley opened Chalkboard in the space that previously housed the beloved, two-Michelin-star restaurant Cyrus. 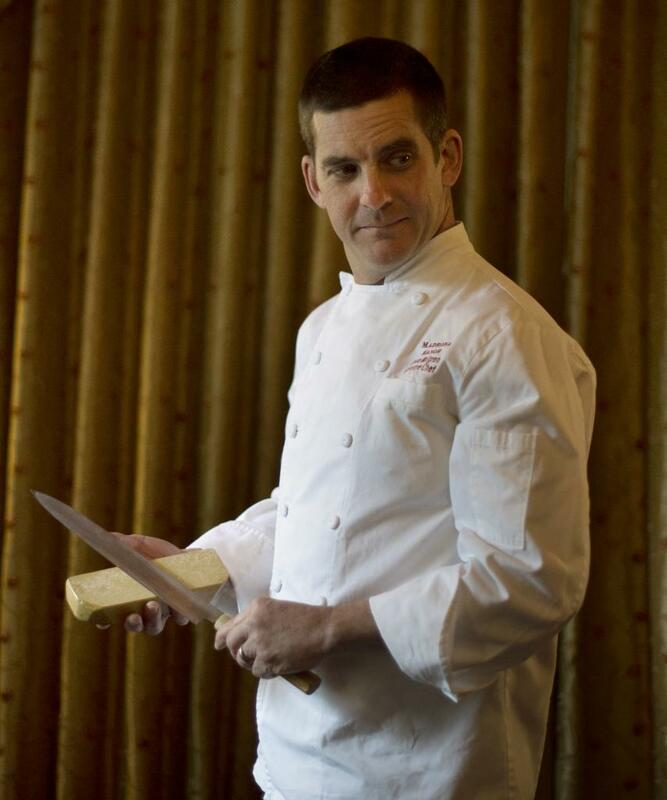 Chef and owner Douglas Keane had vacated Cyrus on rather astringent terms with Foley, the building’s owner, so when chef Shane McAnelly took over the very same kitchen for the opening of Chalkboard in May 2013, it was, and to some degree still is, hard not to make comparisons. But McAnelly rose immediately above the fracas, winning over locals and visitors with his approachable yet sophisticated menus. Dishes such as warm pretzels with Cheddar cheese sauce, pork-belly biscuits and precious shots of pea soup grace the menu, along with housemade pastas (squid ink, cocoa carbonara) and hearty meat dishes including fried chicken and lamb tacos (with pickled kohlrabi, just to keep it classy). Using the epic gardens of Chalk Hill Estate (also owned by Foley) gives a just-picked quality to McAnelly’s dishes, and a stellar wine and beer list adds to the “everyone hangs out here” vibe. He briefly tried his hand at a higher-brow tasting menu in the hotel’s library. Though fleeting (running two entirely different menus proved a challenge), it polished McAnelly’s chef cred, with perfectly plated, of-the-moment bites paired with unusual wines and beers. He’s a chef of many colors, for sure. Chef/Owner Darren McRonald at The Pullman Kitchen in Santa Rosa’s Railroad Square. Like Chalkboard’s McAnelly, Darren McRonald took over a restaurant space with a storied history and a loyal following, Josh Silvers’ Syrah Bistro (and later Petite Syrah) in Santa Rosa. It’s not an easy act to follow, especially since Silvers’ legacy moved across the street to his Jackson’s Bar and Oven. But McRonald quietly opened the revamped space in summer 2014 with a menu that speaks to both comfort and luxury. The roast chicken is a standout, with crispy skin and juicy, tender meat (both light and dark), serving the bird with a light pan sauce and two dreamy spinach Parmesan pancakes. 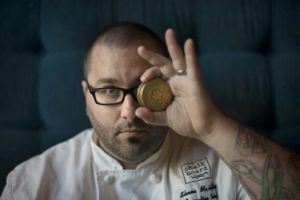 He’s done stints at Le Cirque in New York City, Chez Panisse in Berkeley and Cindy’s Backstreet Kitchen in St. Helena, as well as being a managing partner at the former West County Grill in Sebastopol. It’s easy to taste those echoes in his cooking: bavette steak; Jonathan Waxman’s brick chicken; seasonal California produce a la Chez Panisse; Cindy Pawlycn’s knack for comfort classics. A quiet presence, McRonald doesn’t showboat, instead letting his cooking speak for him. Chef/owner Ari Weiswasser at Glen Ellen Star in Glen Ellen. A few weeks before opening their jewel box of a restaurant, Ari Weiswasser and his wife, Erinn Benziger-Weiswasser, held a preview party featuring several of their wood-fire-oven dishes. Relatively unknown in Sonoma, despite his stints at the French Laundry in Yountville and Daniel in New York, Weiswasser’s wine-braised short ribs with mustard flowers, gnocchi with orange-blossom honey, and grilled escarole salad wowed the crowd. Word got out fast. At opening, the wait for a table at Glen Ellen Star could be excruciating, and more than two years later, reservations are still necessary. Weiswasser’s secret? A cuisine that defines Sonoma with a menu focused on the wood-fire oven, backyard-picked produce from Benziger Family Winery’s biodynamic plots just up the hill, sustainably raised local meats, and a jeans and T-shirt vibe that makes the signature vanilla-maple-bourbon ice cream seem like the only rational dessert choice. 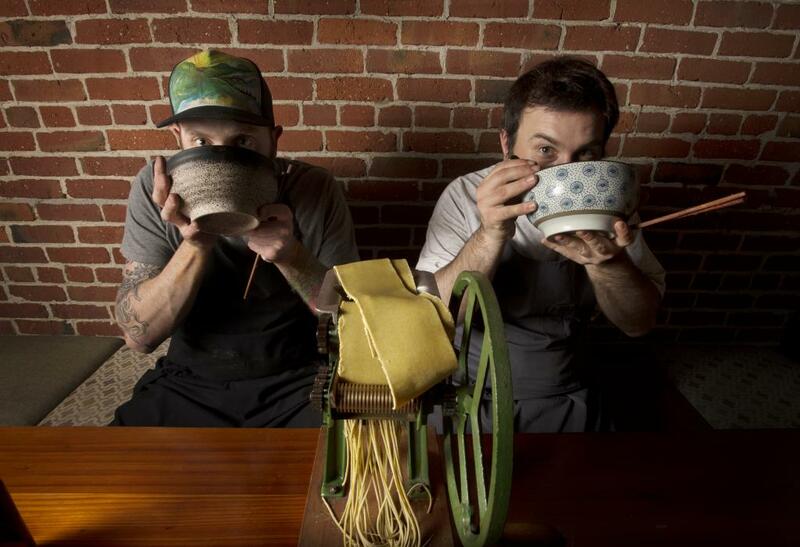 Chefs and co-owners Matthew Williams, left, and Moishe Hahn-Schuman at Ramen Gaijin in Sebastopol. Who knew Sonoma was so starved for authentic Japanese ramen? The Ramen Boys. What began as a weekly pop-up inside Woodfour Brewing Co. at The Barlow center in Sebastopol has turned into a semi-regular dining experience that continues to draw crowds in Ramen Gaijin’s new home down the street, in the former Forchetta space. Dedicated to the principles of this ancient noodle dish, Matthew Williams and Moishe Hahn-Schuman make nearly everything by hand, from the pork-infused miso soup to toasted rye noodles, brined soft-boiled eggs, locally sourced pork belly and mushrooms. Serving up bowl after steaming bowl, they know that sometimes less is so much more. 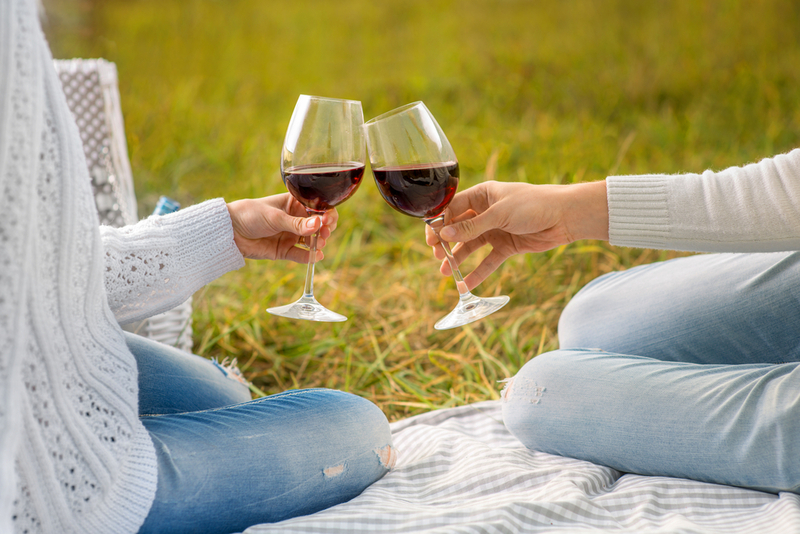 Whites, rosés and lighter reds are on the menu for spring.